The Santa Clarita city council on Tuesday voted to oppose California’s “sanctuary state” law and to support the Trump administration’s lawsuit against the state. City council members voted 5-0 to officially oppose Senate Bill 54, which limits cooperation between local law enforcement and federal immigration authorities. Multiple California cities and counties have opposed the bill — which was signed into law by Gov. Jerry Brown (D) in October 2017 — but Santa Clarita is the first city in Los Angeles County to do so. 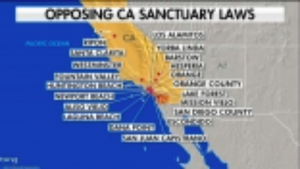 On “Fox & Friends,” Fox News contributor and California resident Tomi Lahren said Californians are waking up to the danger of sanctuary policies. “City by city, area by area, county by county, we are seeing it. Make no mistake, California will not tolerate lawlessness anymore,” she said.